Serving New Mexico homeowners with expert design and installation since 1999. Licensed and Insured Staff: Our team of dedicated staff is rigorously trained to ensure your home is in the best hands. Flexible Financing: We’ll work with you to make sure your project fits your budget. Top Designers and Installers: We hire the best in the industry to guarantee your home functions as beautifully as it looks. Personalized Attention: Our mission is to bring your vision to life with our fully customizable renovations designed to fit your unique needs. Free Design Consultation: Schedule a free, no-obligation meeting with us today and find out how we can best serve you. 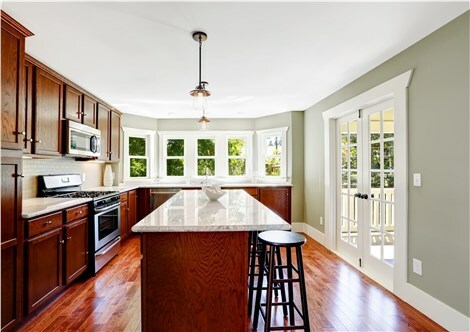 Want to add an open layout and bring a fresh look to your kitchen? Hoping to reorganize your cabinets or make room for that new oven you’ve always wanted? Let Full Measure Kitchen & Bath’s expert designers and professional installers bring your dream kitchen design to life with our top-quality and completely customizable products and service. Looking to revamp your kitchen without the expense of installing new cabinetry? When you reface your cabinets with us, you’ll get brand new hardwood doors and drawer headers, as well as fine veneers finished to match. Our quality cabinet refacing offers you the flexibility to choose how much or little you want to change the look of your kitchen and offers space and accessory solutions without the hassle and expense of replacement. When you’re looking for a new shower installation for your home, Full Measure Kitchen & Bath has just what you need. Whether you want a space-efficient shower or a luxury bathroom conversion, we offer the best in products and service. And, because we know how important your time is, our shower replacements take as little as one or two days. Spend more time soaking in your tub and get rid of unsightly chips, outdated colors, and leaky seams with a Full Measure Kitchen & Bath bathtub replacement. Your bathtub is there for you to enjoy, so let us help turn it into a top-quality tub you want to use. Our high-quality acrylic products never chip, fade, crack, or warp, giving you the beautiful, durable bathtub you always wanted. Avoid the frustration of an inefficient tub design and let Full Measure Kitchen & Bath upgrade your bathroom with a walk-in tub. We understand the unique circumstances that come with choosing a hydrotherapy tub, and we offer an expansive selection of products to help you customize your walk-in tub installation to meet your exact needs. Our services don’t stop at the list above – we’re dedicated to realizing your dream renovation, and we have the skills and experience to get the job done right. Here at Full Measure Kitchen & Bath, we are all about customizing an installation that exactly fits your needs, your home, and your budget. Give us a call today, or fill out our online form to get your free design consultation and start planning your kitchen or bath remodel today! If you're in need of quality windows or a beautiful sunroom addition, contact our sister company: Sandia Sunrooms & Windows!